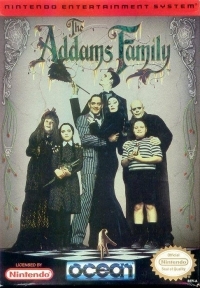 Box Text: THE ADDAMS FAMILY has been evicted! To save their home from Tully Alford, the family attorney, who is after the family fortune - Morticia, Lurch, Granny, Pugsley and Wednesday have gone to the house to reason with him. But when Gomez arrives, his family is missing! As Gomez, you must save your loved ones, your home and your loads of wealth. Freeing your family will take money, bags and bags of it; but fortunately, you'll find stashes of cash hidden all over the house. You'll have to watch out for scary obstacles like falling spikes, frightening monsters and ghosts. 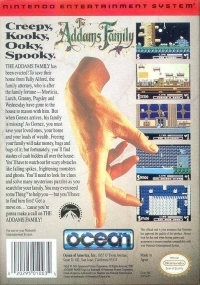 You'll need to look for clues and slove many mysterious puzzles as you search for your family. You may even need someThing to help you - but you'll have to find him first! Get a move on... 'cause you're gonna make a call on THE ADDAMS FAMILY! 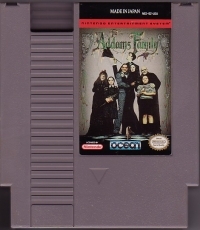 08-20-2011 atariboy Box Text THE ADDAMS FAMILY has been evicted! To save their home from Tully Alford, the family attorney, who is after the family fortune - Morticia, Lurch, Granny, Pugsley and Wednesday have gone to the house to reason with him. But when Gomez arrives, his family is missing! As Gomez, you must save your loved ones, your home and your loads of wealth. Freeing your family will take money, bags and bags of it; but fortunately, you'll find stashes of cash hidden all over the house. You'll have to watch out for scary obstacles like falling spikes, frightening monsters and ghosts. You'll need to look for clues and slove many mysterious puzzles as you search for your family. You may even need someThing to help you - but you'll have to find him first! Get a move on... 'cause you're gonna make a call on THE ADDAMS FAMILY!